Chevron Nigeria Limited (CNL) is Chevron's principal subsidiary in Nigeria, one of Africa's most prolific oil-producing countries. CNL and its related companies have done business in Nigeria for more than 90 years and CNL's workforce totals more than 2,000 employees, of which 90 percent is Nigerian. CNL operates and holds a 40 percent interest in 13 concessions covering 2.2 million acres (8,900 km2), predominantly in the onshore and near-offshore regions of the Niger Delta. In 2007, total daily production averaged more than 350,000 barrels of crude oil, 14 million cubic feet of natural gas, and 4,000 barrels of liquefied petroleum gas. The company's net oil-equivalent production in 2007 was 129,000 barrels per day. The Escravos Gas Plant is located in the vicinity of the Escravos River, adjacent to the Chevron Nigeria Oil Terminal, on the Bight of Benin. The site is approximately 100 miles southeast of Lagos and 37 miles west of Warri. The existing Escravos gas plants (hereinafter EGP1&2) process 285 million standard cubic feet of natural gas per day (scfd). This will be increased to 680 million scfd with the completion of a new gas plant (hereinafter EGP3) by 2009. Yokogawa Electric Korea received an order from Hyundai Heavy Industries (HHI), the project EPC contractor, to replace EGP1&2's existing Honeywell TDC3000 system with the CENTUM CS 3000 system and to install an integrated control system (DCS, SIS, CMS, and FGDS) at EGP3. The main objective in the EGP1&2 phase of this project was to do an online hot cut over from the legacy Honeywell TDC3000 to the Yokogawa CENTUM CS 3000. The hot cut over involved the Train-1 operating plant and the processes at EGP1&2. This included migration of the existing fire and gas monitoring signals and migration of the existing serial communication interfaces for the existing PLC controlled ESD system and the master surge CCC compressor control system. The contracted work was scheduled to be completed in 90 days. 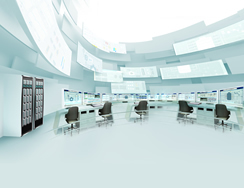 The key business driver for this online system migration: estimated savings of US$2.3 million by not shutting down gas plant operations for 90 days. Secondary business consideration: by doing the system migration in the second quarter of 2008, operators would have time to familiarize themselves with the new CENTUM CS 3000 control system before the main EGP3 control system is introduced in 2009. 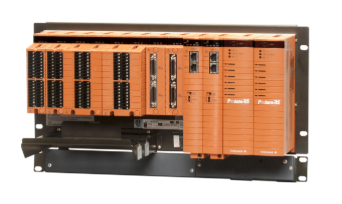 Migration scope: migration of all EGP1&2 control system signals/functions from the legacy Honeywell TDC3000 DCS to the new Yokogawa CENTUM CS 3000 and the migration of 279 digital input signals, 127 digital output signals, 322 analog input signals, 59 analog output signals, 480 WORKPACKs, and 787 loops. WORKPACK means that whole procedure and concerned data in order to HCO work of each loop. Replacement of existing Honeywell field termination assemblies (FTAs) in marshalling cabinets with new Yokogawa terminal boards. 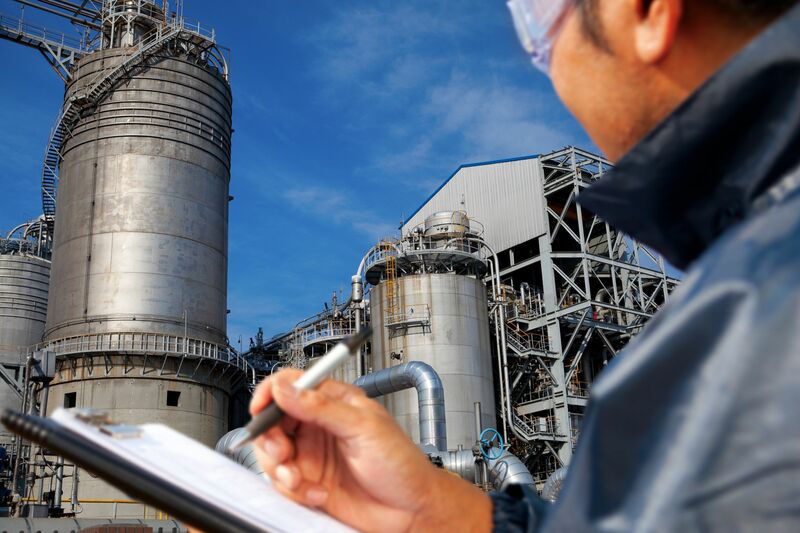 The greatest challenge in this project lay in carrying out the migration from the existing Honeywell TDC3000 to the new Yokogawa CENTUM CS 3000 without disrupting gas production. This online hot cut over required both systems to be manned by operators during the migration process. 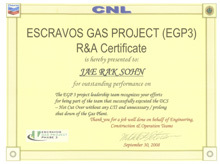 Although this presented a high risk for disruption to ongoing gas processing operations, the work was successfully completed 48 days ahead of schedule and without disruption to operations thanks to detailed planning, risk/mitigation analysis, and a robust execution strategy with a coordinated team approach between CNL/HHI and Yokogawa Korea. Through the successful execution of this project in just 42 days, CNL was able to avoid a costly shutdown of operations and generated additional savings in labor costs. And by working together on this project, CNL, HHI, and Yokogawa Korea were able to build a strong relationship. Thanks to their efforts, the CENTUM CS 3000 is running smoothly at EGP1&2. "The new CENTUM CS 3000 DCS equipment has exhibited excellent performance thus far." "The DCS vendor provided effective technical leadership throughout the hot cut over and demonstrated a good command of English, avoiding potential communication problems. Technical challenges were encountered throughout the execution phase but these were resolved in an expeditious manner." "The DCS vendor's sub-contractor panel technicians kept to a demanding work schedule for an extended time period. They contributed significantly to the success of this project. Their work has been critically important and it required extensive concentration and dedication from them while working in cramped conditions. Not a single isolation or installation mistake occurred! — Congratulations." "The EGP3 project leadership team recognizes your efforts for being part of the team that successfully executed the DCS — Hot Cut Over without LTI and unnecessary / prolong shut down of the Gas Plant. Thank you for a job well done on behalf of Engineering, Construction & Operation Teams." 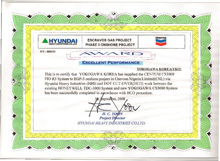 "This is to certify that Yokogawa Korea has supplied the CENTUM CS 3000 FIO R3 system to EGP-3 onshore project in Chevron Nigeria Limited (CNL) via Hyundai Heavy Industries (HHI) and HOT CUT-OVER (HCO) work between the existing HONEYWELL TDC3000 system and new YOKOGAWA CENTUM CS 3000 system has been successfully completed in accordance with HCO procedure."